Not many people can claim the title of “futurist,” but David Brin isn’t your average guy. He’s a scientist, best-selling author, recipient of multiple Hugo and Nebula awards, and someone who relishes tackling the big ideas about the future of society, science and mankind. In these installments from UCTV Prime’s series “It Came from Riverside: Inside the World’s Largest Science Fiction and Fantasy Collection,”Brin gets real about the relevance of science fiction as “essentially American” literature and why it deserves legitimate study at American universities. He also discusses the merits and hazards of extrapolation in science fiction and shows his optimistic side, making the case for enlightened optimism in the face of growing cynicism about and within Western civilization. It’s fascinating stuff and an inspiring way to wrap up an intriguing series. Last week on “It Came from Riverside: Inside the World’s Largest Science Fiction Collection,” we heard from comic book writer and editor Marv Wolfman about the art and craft of writing compelling stories with emotionally complex characters and imaginative plots for comics, animation, video games and everything in between. Now we have the honor of presenting our interview with David Brin, renowned science fiction author and futurist (possibly the coolest job title on the planet), who discusses the merits and hazards of extrapolation in science fiction while making the case for enlightened optimism in the face of fashionable cynicism. Watch “David Brin on The Science Fiction Barometer” from our YouTube original channel, UCTV Prime. 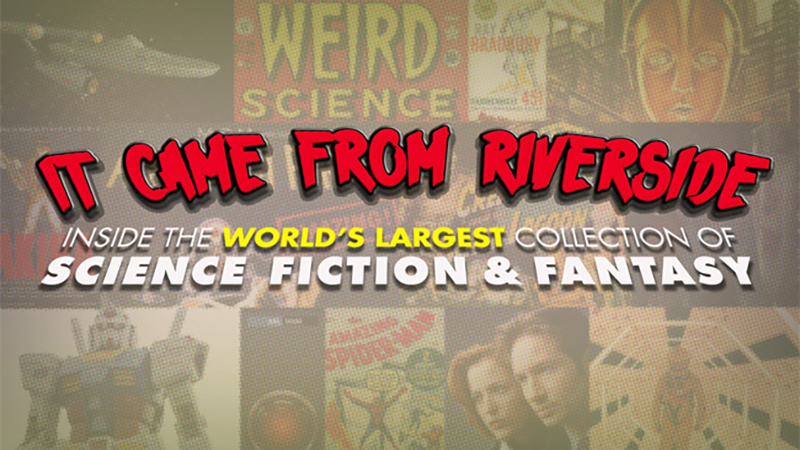 If you’ve watched UCTV Prime’s “It Came from Riverside” series, then you’ve already had your virtual tour of the world’s largest science fiction and fantasy collection (if not, then we suggest you get on it!). Now we get the chance to bring you some bona fide stars of the genre! Today it’s a visit from legendary comic book writer and editor Marv Wolfman (Marvel Comics, DC Comics and more), who discusses the art and craft of writing compelling stories with emotionally complex characters and imaginative plots for comics, animation, video games and everything in between. Watch “The Wolfman Speaks (about Storytelling in Comics and Video Games)” and check back next Friday (Sept 28) for our interview with science fiction author and futurist David Brin! Science Fiction Goes to School! Want to know more about the science fiction studies program at UC Riverside discussed in “It Came from Riverside (Ep. 3): Science Fiction Goes to School?” Well, here you go! Rob Latham, a professor of English and senior editor of the journal Science Fiction Studies, certainly believes that UC Riverside is the developing center for science fiction studies in the world. The Eaton Collection is central to this idea, but the university is also in the process of establishing an undergraduate and graduate degree program in science fiction and technoculture. “UCR is one of the very few universities in the world to have a major library archive in science fiction and a substantial cohort of researchers, writers, and teachers whose work engages with science fiction and technoculture studies,” Latham says. Latham joined UCR in 2008 as part of the initiative to build an SF program. In 2010 [SF writer] Nalo Hopkinson was hired in Creative Writing and this year Sherryl Vint joins the English department. “Now that we have the three science fiction specialists on faculty, the task in 2012-2013 is to put together, at the graduate level, a certificate program (called at UCR a Designated Emphasis) in Science Fiction and Technoculture Studies. Soon afterwards, the program would also likely develop an undergraduate minor,” Latham explained. UCR is home to the annual Eaton Science Fiction Conference, which is devoted to the study of all aspects of science fiction as a literary genre and social phenomenon. Last May, the university also hosted the symposium of science fiction and technology. “Since our goal is to establish a degree program in the field, this one-day symposium [was] geared to address issues relevant to graduate- and undergraduate-level research and teaching in science fiction and technoculture. Our hope is that ideas seeded at this event will find fruition in future academic initiatives at UCR,” Latham said.